How to get there: Go north on Hwy. 82 from the traffic circle just north of Aspen (The Maroon road intersection) for approximately 21 km. Turn west (left) on Snowmass Creek Road in the "town" of Snowmass. Actually, this "town" is mainly a post office and a Conoco gas station (both on the left). Drive about 2.7 km to a T-junction and make a right onto Capitol Creek Road. Follow this road another 7 km (ignoring a few side roads) until it turns into a dirt road. Continue on the dirt road to a "Public Parking" area on the right. Unless you have a high clearance car (preferably a 4WD), this may be the place to park. The road continues as a very rough road, really a 4WD road, for another 2.5 km to the Capitol Creek Trailhead with a good sized area for parking. There is a very scenic view from this trailhead. Capitol Peak stands guard at the end of the valley. From the trailhead one already has a clear view up the vally with Capitol Peak at the upper end. The valley from Capitol Lake is directly across as you look south. The valley bends east right in front of you. The traditional trail descends to the valley floor crosses the creek and takes you up the valley on the east (left) side of the creek. This involves a substantial loss of elevation as you start hiking. A better and also more scenic trail starts out at the north-west corner of the trailhead. This trail will curve around the valley (to your right) and join the first trail about half way up the valley. It is slightly longer, but this is easily compensated by the scenic views and the fact that you do not start out with a big loss of elevation. This trail is sometimes called the "ditch trail" as it starts out very level along an old irrigation ditch. Follow the ditch on a very nice trail that is completely horizontal as it curves around the valley keeping the elevation. After a while the ditch will continue straight while the trail leaves uphill to the right. There is a clear sign saying "trail" at this point. The trail crosses the only significant side valley with its corresponding (small) creek on good stepping stones, then continues into more open fields ascending until a hilltop with some trees followed by another open field where the trail starts a gentle descent into the Capitol Valley. The trail hits the valley floor about halfway to Capitol Lake. The Capitol Creek must be crossed at this point. There was not too much water and the creek could be jumped, there was also a log that spanned the creek at this point. (This was a dry year, earlier in the summer this creek could possibly be a bit more tricky to cross without wading, perhaps in particular going the opposite way.) The trail now continues up the valley. Soon, there is a signed trail climbing east called West Snowmass Trail, continue along the main trail following the valley. The trail passes meadows with flowers and small sections of trees as it climbs, first gradually then steeper towards Capitol Lake. At the end the climb is more substantial and one crosses the creek a couple of times. The lake itself is hidden from view behind a few knolls as one climbs the final slopes. There are isolated groups of trees in this area with nice campsites. We stopped at such an area just north of the lake and very close to the trail junction where the Capitol Peak trail goes left from the trail to the lake. This campsite was located at North: 39.09.944, West: 107.04.896. 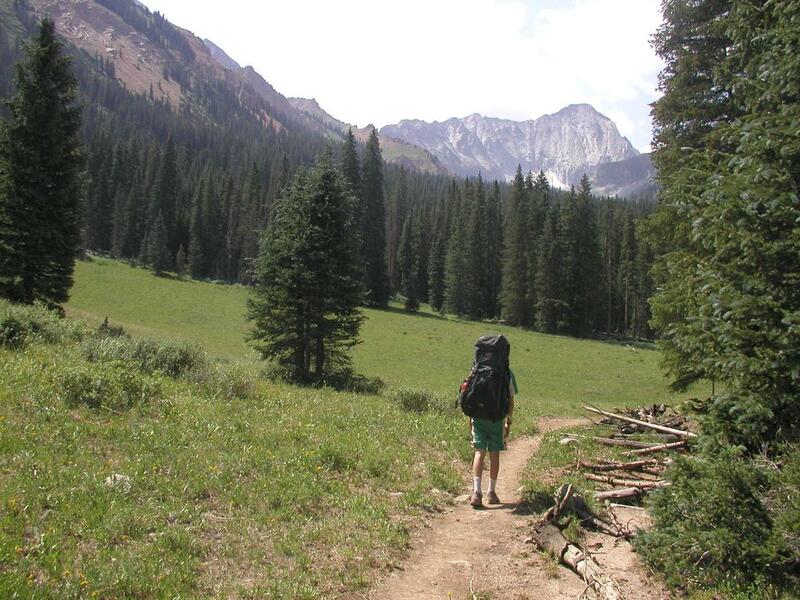 The trail to Capitol Peak takes off across a huge meadow full of wild flowers sloping up towards an obvious saddle. When we were there the Colorado Fourteener Initiative had some volunteers working on making a better (zig-zag) trail to the saddle. This saddle is easy hiking, but then there is almost no more trail to follow. Just beyond the saddle, the trail will lead you slightly right and into a loose gravel gully that descends steeply towards the basin below. Follow this gully down until it is easy to continue right. The route is now in the valley (west) across rocks and boulders. As you gradually climb through the boulders staying left of more difficult terrain, you will see a snowfield higher up. Pick your course to the right of this and gradually a small, but distinct cone shaped summit will come into view. This is K2 and the approach part of the climb is over when you are there. In order to gain the summit of K2, one can either climb a short rock ridge directly or climb down a couple of meters to the right (solid rock) then immediately regain the small summit (YDS class 3). From K2 one can see the ridge connecting to Capitol as well as the area of the remaining route. The terrain in front of you looks complicated. Descent north (to your right) among larger rocks on a small, but clear ridge line. This down climb is easy scrambling. Continue down until a clear and easy route leads you back to the ridge connecting K2 and Capitol. Some people try to avoid K2 by traversing directly to the ridge north of K2. While possible, this looks unpleasant and not worth the small saving, the summit of K2 should be part of this climb. You are now on the ridge. The first point of interest is where you get a great view south-east to the Pierre Lakes and the general area towards Snowmass Mountain. You will soon find that the ridge narrows and a small mini-knife edge appears. This is easy as you have a small, but perfect ledge to walk on as you hold on to the top of the ridge. Next, is the famous Knife Edge. This section of the rock is impressive, but technically quite easy. The north sloping part is very smooth rock (you may see Capitol Lake deep below), however, the south sloping part has more irregularities. The best technique is to generally stay on the south side and hold onto the top of the ridge. There are several places along the way where one have reasonably good footing. The very last part of the ridge gradually becomes a bit wider and one can complete the crossing on the very top of the ridge. Much route finding remains. 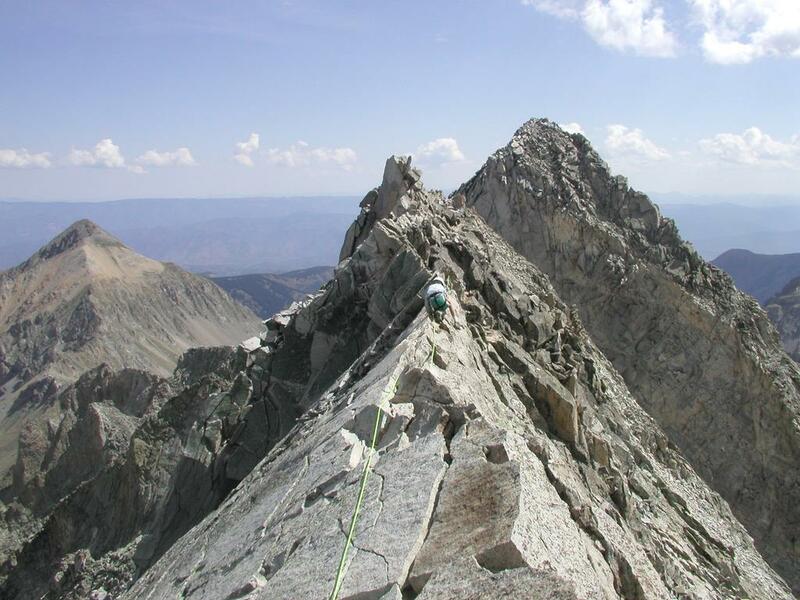 Continue across the now wider ridge and start out climbing as you move on to Capitol proper. One can continue more or less directly on the ridge to the summit, this is continued class 4. 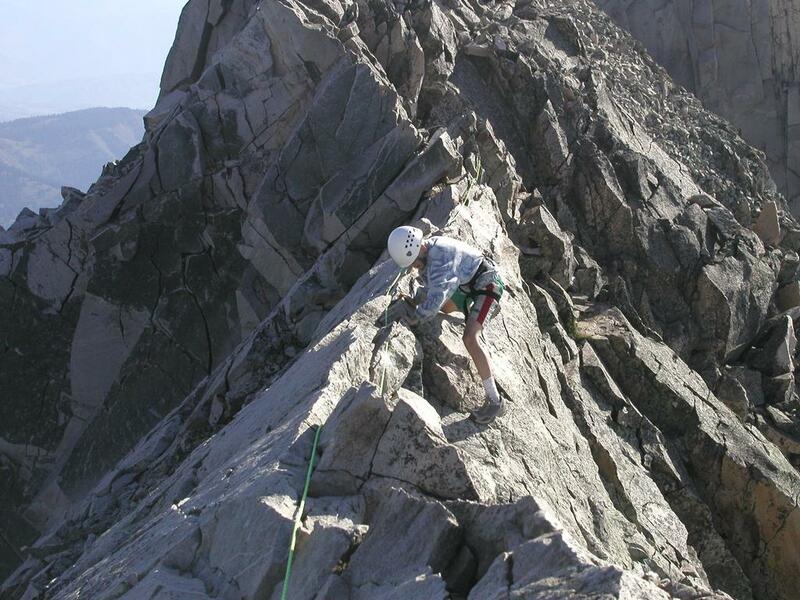 The easiest (but perhaps somewhat less safe) route enters the south-east face of Capitol. First traversing across a fairly distinct gully, then gradual ascent as you cross over into a second, somewhat wider gully. There are loose rocks and scree in this area, move carefully. As you enter the second gully, climb up and move back to the same area that you entered from, but higher. Continue to climb up among better rocks (with the wider gully still on your left) then find a good ledge that crosses the gully quite high up. The route will now get you onto a fairly distinct ridgeline coming down the south-east face beyond the wide gully. 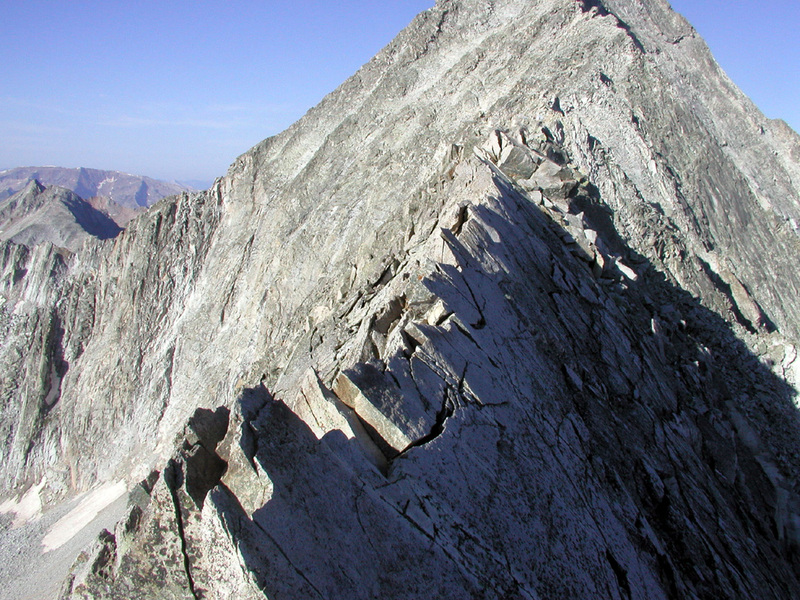 This line has better rock and one can ascend up towards what may appear to be the summit. Higher up this ridge line becomes less steep and a clear zig-zag path leads the way back to the main North-East Ridge of Capitol. 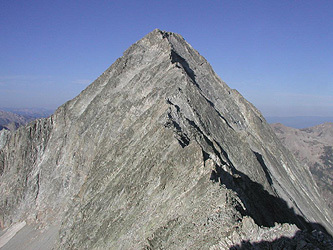 What appeared to be the summit is just a point on the ridge, however the main ridge can be followed without much difficulty from here to the summit. The route has good exposure, especially to the north (right), but the large boulders and rocks along the ridge appears to be quite stable. Pick your way and soon the summit is there. Note: There are obviously many variants in this south-east face. Several of these are (at least partially) marked with cairns. What has been described was reasonably well cairned and seems like a good compromise between the loose (and dangerous) face and the better rock along the ridge. Each party must use their own best judgement. Comments: I did this climb with my son Pål Jørgen, age 13. We hiked from the Capitol Creek trailhead along the upper, more scenic "ditch-trail" arriving Capitol Lake at 1215 after 2 hours and 45 minutes of hiking. We started from a camp near Capitol Lake the next morning at 0535 and reached the summit after 3 hours and 55 minutes. We rested and enjoyed the views and solitude for about 15 minutes. We were back at the summit of K2 6 hours after the start, so it took one hour and 50 minutes to climb back. We subsequently reached the tent after 7 hours and 15 minutes at 12:50. Pål Jørgen crossed the Knife Edge using a sling attached to a rope for safety. One climber passed us on the way up, it is possible that two climbers that we met when returning across the Knife Edge also made it to the top. 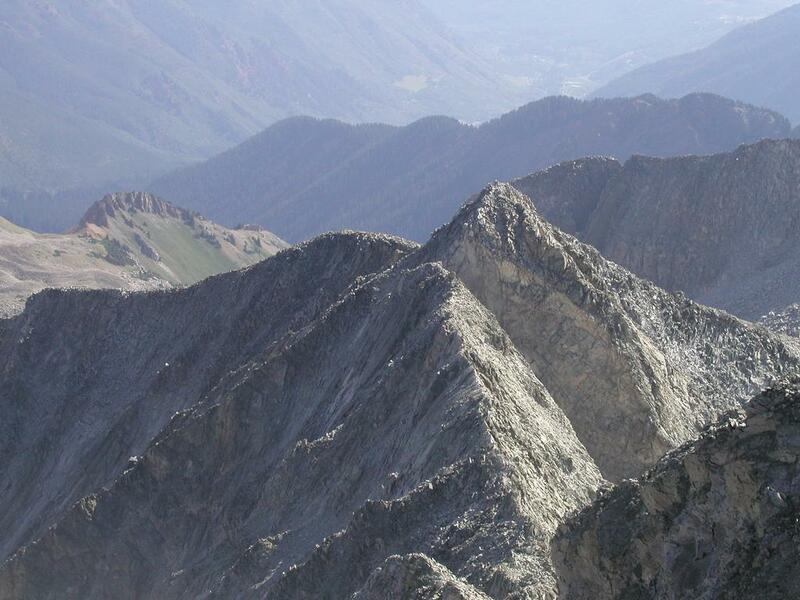 A party of three climbers turned back without reaching the summit. Pål Jørgen hiking to Capitol Lake. The route to K2 including the Knife Edge.